Based in Carlsbad, California, Wax Research maintains a mission to produce superior products created through a never ending quest for innovation and experimentation by the use of improving technologies and evolving business practices. In that, Wax Research is a family owned and operated corporation than manufactures uniquely customized emulsified wax and polishing goods. 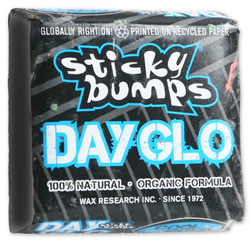 From sports wax and removers to sweatshirts and assorted surf gear, Wax Research also maintains a distribution branch called Sticky Bumps that furthers the brand identity of Wax Research's manufactured products. 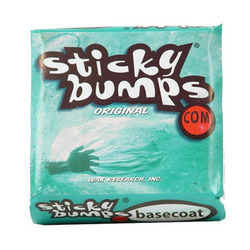 With that, Sticky Bumps sponsors a large team of surfers, including Bethany Hamilton and Sebastian Williams, to showcase the extensive line of surfboard waxes, apparel and headline products like that of the Sticky Bumps Wax Remover. As step one in the Surfboard Wax process, always start with a clean deck. 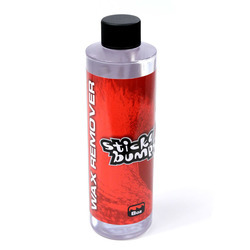 With that, the Sticky Bumps Wax Remover makes efficient use of a citrus formula to efficiently clean your board without damaging the goods. Next comes Wax Research's Sticky Bumps Base Coat Wax. 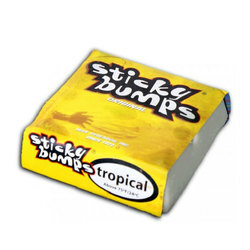 Critical in getting an optimized bump structure, the Sticky Bumps Base Coat Wax provides a proper foundation from tip to tail to keep you sturdy out in that rocky sea. And based on the temperature or time of year you find yourself out amidst the waves, Wax Research's Sticky Bumps Wax - Cold finishes the job and gives you the crisp edge in carving your way amidst the brisk waters. More still, with the Sticky Bumps - I Love Boobies Wax, you can help fight cancer with proceeds of the purchase supporting The Keep A Breast Foundation. 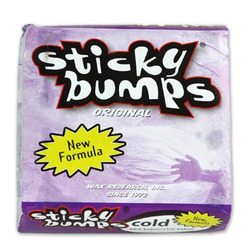 Additionally, with the Wax Research Sticky Bumps product line continuously expanding to give you what you need — you can give yourself some helpful enhancements and necessary protection for your gear with Sticky Bumps board bags and Surfboard Socks. And if you are going the distance with it all, the Quad Coffin with Wheels is sure to get you there with a Tech Mirror foil heat shield and PVC nose protector keeping your gear from getting dinged on the trip. 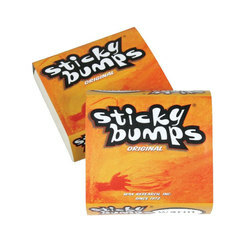 More so, Sticky Bumps also features traction pads for the Stand Up Paddlers out there. Plus, with the Rastovich 2 traction pad, you have a product created entirely with recycled material so while you paddle along you can feel appeased with your little environmentally friendly contribution as you enjoy the environment's always giving glory.